It's a very personal thing, I can understand your boyfriend doesn't want to do it. I started out simply minimizing my debt , and therefore risks when my income should drop significantly. Once I got to a comfortable level with that I was wondering what is more valuable time or money. Turned out it's the time you spent activities that add value to your life. In my case that wasn't the job I had , working long hours and making lots of money. Money became a way to keep score. Bit ridiculous. I never got the real change to switch career paths as I became ill. That was a turning point and I knew the road to FI was the right choice. After my recovery I will only spend time on projects that add value to my life, and hopefully others. FI is a great way to get away from the rat race and focus on those projects. If you work on a project that adds lots of value to your life , you will continue to do that. In your boyfriends case his company. Which is great, because you're doing something you love. And if that makes you enough money to live comfortably why not. There is not one set way to reach your life goals. Although I can imagine it might cause some friction in a relationship. Especially when it's just coming from a notion that you have to work hard. Which is largely ingrained in our upbringing. And stems from times which were a lot harder. It's real hard to let that go. I had to let the 80 hour weeks go because I couldn't do it any more, but I sometimes wonder if I would have done it when I reached FI and being healthy. I am not sure. Net worth now slightly over 105k, thanks to the bonus (13th month) and a reasonably good January salary. I saved 32% of my income in December (13th month, but I prepaid my annual health insurance premium for 2017 which was roughly 1200 euros for the year) and I saved 33% in January. I am glad to report that everyone's healthy now, after that health scare for my father, and also a lot of flu for everyone in my nearest family. Given that, I think my three weeks of having a cold were merely annoying. Let's hope this was it for this winter. The weather has been warming up these last couple of days, and I feel ready for spring. (Hayfever, jay!). We've not been househunting recently. My boyfriend's business took up most of his time. It's developing nicely; and it's interesting to work on that (for him) and to see it (for me). During the week off, I also really noticed how I kind of need to work. It gives aim and purpose to my days. So that is something else to work on over the next couple of years. I am still hoping to not have to work at some point, but I should really come up with other useful stuff to do, then. (And "useful" meaning something that I find useful - others may have different ideas about what is useful; but to me it should be interesting/valuable etc). Keep going! Stash is increasing nicely and almost 1000 posts! Not want to kill your spring-vibe... But the (real!) cold is coming to The Netherlands next week. And it will get COLD. He @Dutchgirl, good to see the progress. And about yr bf, he might be sooner FI than you if his company works out If I were him, I would do the same on focusing on building up the company (almost jealous / I always wanted this, but never had the guts). Looks like a good balance that you are FI focused though!! DutchGirl wrote: During the week off, I also really noticed how I kind of need to work. It gives aim and purpose to my days. So that is something else to work on over the next couple of years. I am still hoping to not have to work at some point, but I should really come up with other useful stuff to do, then. (And "useful" meaning something that I find useful - others may have different ideas about what is useful; but to me it should be interesting/valuable etc). This to me is key. At this point in your life, ERE is an option. But later on, you might not be able to work due to opportunity or God forbid, health. Then what? I often have "Pretend" retirement days where I say, OK, I'm retired, what am I going to do. And I have found that I am very happy just reading and watching documentaries. If I'm solvent enough, I can go back to school. Its that simple. Just one/two things. I remind myself off all the people I don't have to talk to. Its bliss. I work in an industry where no one gets fired. One guy was technically dead two months ago and now he's in the office looking like he's auditioning for Death in an Ingmar Bergman film. Everyday I remind myself, work to live and don't find my identity in this. One day, I'm just going to say "F-It" and no one is going to care except me and the Mrs.
Good progress with the savings. You sound like you recharge when alone: classic introvert, if so. So, February... (I'm not spending any money tomorrow, no travel needed and I have groceries at home). Income posttax 2567 euros, expenses 2249 euros. That's a pretty lousy savings rate of just a bit over 10%. However, 600 euros were an annual contribution to a charity (I will get 40% of that back at tax time) and I also paid 240 euros for a full course to become a personal financial planner in the Netherlands. Becoming a personal financial planner could become my second career, perhaps, or studying the material would just make me more familiar with all aspects of personal finance for myself and those close to me. I'm not sure yet. I like helping other people, and I like personal finance. I would want to be an independent planner (not associated with a particular bank or institution). But I'm not sure whether I'd like to deal with for example people who don't listen to my advice, or people who are going through some nasty divorce or something like that and want to have advice on how to handle that financially. I don't know whether the job would be fun enough to do (especially when close to FI or FI). I am by the way thinking about contacting a financial planner or two and asking them whether they can tell me more about it, or have me sit in with a few sessions. A few days ago I first sanded and then refinished two tables at home. I'm really happy about one table that looked really shabby before, and now again looks shiny new and tip top. With the other one, there were some stains in the wood, and they are still shining through in the finished product. But still, it looks much better than it did before. 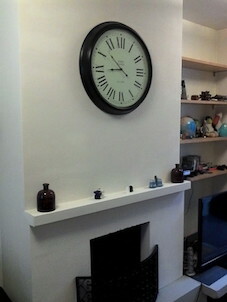 1. paint the area around the fireplace in the sitting room. 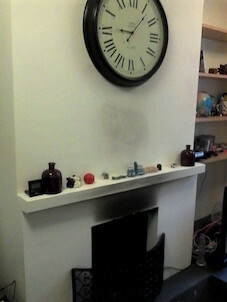 Lots of soot accumulated (it's not a very good fireplace), so it needs a fresh coat of paint. 2. sand and refinish a few parquet boards upstairs, where in the past I dropped some turpentine on them (I'm sometimes clumsy) so that they are partially bare now. 3. we have a room full of boxes with stuff and more stuff. I want to organize it. Most of the stuff is my boyfriend's and he doesn't want to get rid of it. But at the very least, it can become more organized. And the stuff in there that is mine can be sorted, and some of it sold/donated/thrown away. 1. Sort out our pots and pans, throw away the ones that are flaking, and perhaps buy one or two new ones that are truly missing from the collection. 2. I am going on a skiing trip with my family for a week, looking forward to that, except to the eight-hour road trip to and back from the skiing area in Austria. Oh well. 3. There's a pile of roughly ten dvds that I still have to watch, and then sell or donate afterward. 4. Reading some of the personal finance course material, of course. So... quite enough projects for just one month. Let's see how it goes. Hi DutchGirl, glad to see you're making progress! Being a financial consultant could be a lot of fun . I'm curious, would you mind providing some insight into the political situation in the Netherlands? Do you think fears about Geert Wilders are overblown, or no? DutchGirl wrote: But I'm not sure whether I'd like to deal with for example people who don't listen to my advice, or people who are going through some nasty divorce or something like that and want to have advice on how to handle that financially. DutchGirl, one of the challenges for me as an accountant (often called on to offer financial advice) was dealing with people who did dumb things regardless of my guidance. This is a real struggle, and you need to decide whether you can act as a guide and yet let go of rancor (or guilt) when your clients insist on walking in the other direction and fall off a cliff. Trust me: they will still be calling you from the chasm. You really need to decide if you can divorce your feelings and personal code from your (potential) job. If so, this could be a good path for you. If not, you might be consuming a lot of alcohol. 240 euros for a full course to become a personal financial planner? This sounds crazy cheap to me. Or is it on top of something else? I guess for this amount there is no room for learning about the psychological aspects of dealing with clients which I would suppose is the most central aspect of being a personal planner of anything. You're right. There's another 240 euro fee for a practical class on how to talk to clients. This is just the theory. Oh, and then I can pay 200 euros more for practice tests. And I would have to pay even more euros for the real exam. I just figured I would start with the theory and then do the rest later, if I wanted to. @halfmoon, thanks for all the information . I'll really have to think about it, I guess! Anyways, good job on working on your DYI list. It gives a sense of peace when you can tick off something of the list. A room full of boxes are however maybe an indicator that you have to much stuff? Not saying I do not have any boxes but when I moved here I did get rid of most of the unneccesary ones. I'd love to take some Dutch financial advice from you in a couple of months. So it's looking a lot better, and I'm pleased with the result. Just one coat of paint was needed. I also changed the bottom part (beneath the fireplace, you can see it in the bottom right corner of the pictures) from dark to light gray and I'm happy with that result as well. I also finished organizing the room full of boxes and the bookcases. So that's two out of three done, but number three hasn't been done, yet. For the other projects I mentioned, I did sort out the pots and pans, and I did go on holiday with the family (it was very nice), and I am working on seeing all those dvds (so far saw two). But I didn't do any reading/learning of financial information just yet. Must do that at some point in the future, but ... haven't taken the time just yet. As for finances, in March I had a regular income of roughly 2600 euros, but also had side income of 400 euros. So total income roughly 3000 euros. Expenses were high at 2013 euros, but included in that figure is 820 euros of donations to charities (and I will get some of that back come tax time 2018). I've decided to simplify my charity spending and that's why I'm spending a lot in the beginning of the year, in a few big payments, and then only very little during the rest of the year. I also had high travel costs (well, 143 euros) which are mostly work-related and will be reimbursed next month. And I also still spent too much on fun stuff (like books and candy and presents etc) for 207 euros, where I had hoped to keep that under 100 euros for the month. At the beginning of March, I gave the bookkeeper all information for our tax return. However, he then always sends us his proposal for the return, and I haven't seen that yet (more than a month later). It's a busy time for bookkeepers, I guess. I will probably owe a few hundred euros because I had side income last year that I hadn't paid taxes on, yet. So I'm not in a rush to have this return finished up . By the way, we have a bookkeeper do this, because he also does my boyfriend's books from his business. So that's a relatively short update for March. Last edited by DutchGirl on Fri Apr 14, 2017 3:01 am, edited 1 time in total. Nice job on the fireplace! Do you plan to keep on paying to charity after you retire? Maybe you could donate time instead of money? Hi Eureka, it's possible that I'll do that instead. My plans aren't completely fixed, yet. We finally got the tax info from the accountant. For me it was a relief to see that I only owe 113 euros. I thought it would be more like 300 euros. And yes, I made sure that the numbers that the accountant filled in are correct; my estimate apparently was a bit off. I owed 113 euros because I worked a small job on the side in 2016, for which I hadn't paid taxes yet. April was a reasonable month financially. Income was just the regular income at 2600 euros (the amount varies a bit depending on the travel allowance and how many hours I worked after 6 PM during that month). Expenses were 2500 euros, of which almost 900 euros went to charity, 250 euros to a niece for her study fund, 100 euros to traveling (we were in London for a long weekend, it was fun!). I spent over 200 euros on transport for the month, roughly 110 euros of that were bike repair costs (new saddle, new chain, etc). I feel like the bike is now ready for the spring/summer/autumn during which I'll use it more often. I'm looking forward to May, during which I'll have more money to put towards investments, as I get my vacation money in May, which should be another 1400 euros or so on top of my regular salary. In very recent developments: we've talked to a realtor about selling our house. He also came and checked the house. We prepared for that by cleaning the whole place. The fact that I had already painted the fireplace and sorted the boxes really helped speed that up! The realtor also advised my boyfriend to have some more painting done. Mostly areas that were painted bright red or bright blue before my boyfriend even bought the house. The realtor thinks it's a bit off-putting (which was my suspicion all along as well). We've also seen a possible new house to buy that looks promising. It came on the market this Saturday, and we'll hear more about that today. The boyfriend is casually optimistic about this one, which is quite something. But we'll see. Good luck on the house hunt, it can be a tricky time for buying a house. But coming from a good financial position it can actually save you money at the moment. We ended up moving to a slightly bigger place and now pay less for housing and energy than before.